Diana, someone commented on your Facebook page that the lines of the symbol had eight intersecting points, like the intersecting story lines…I thought that was a lovely and apt observation! I work with fabric and the black octothorpe pictured on your link, made my fingers itch to pull the two outer loops to make a macrame knot. Thanks too for the snippets, teasers and daily lines, they keep the interest level high and ease the tension of waiting. Continuing working your magic, we know the wait will be worth it. Vicky, now that I think about it, pulling those threads would make a beautiful knot. Diana, beautiful cover. Now, I have a strong urge to crack open that seal and see what’s in that note. Reading “A trail of Fire” at the moment, filling the so called black hole till the 8th book will be available in a Dutch translation. That will be next year I assume. Curious how that is done. Do you have a translator working on the first part(s) of the book while finishing it? And is there only one translator or more than one? Hope to start doing some translating myself professionally very soon; ultimate job would be working on translating this book! Well, see, I don’t write in a straight line. So usually, a translator can’t begin work on one of my books until the whole thing is finished. J’attends avec impatience que le dernier livre soit traduit en francais. Philippe SAFAVI a traduit les précedent. Pareille pour The Scottish prisoner!!!!! It reminds me of the letters in the box that Jamie and Claire sent down through the centuries. Some still unread. The wax seal cracked with age. I am so curious to find out what is in those letters. They could have given away too much though. Diana you sure know how to keep our interest! I LOVE IT!!!! It also reminds me of an infinity symbol which could symbolize Jamie & Clair’s love for each other. Can’t wait till December!! How long will it take to come out on kindle? The Kindle (and other ebook formats) version usually comes out at the same time as the hardcover. That’s very interesting how that came about. I really enjoy reading extra fun tidbits about the series. 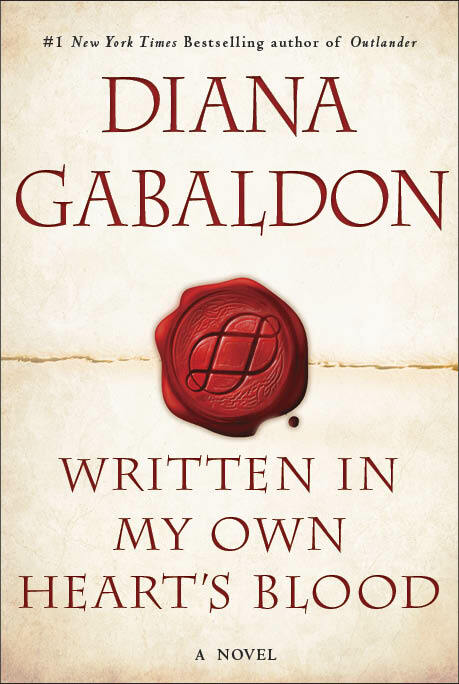 May I ask what is the word count for each book in the Outlander series? And I don’t think I ever did a formal word-count for ECHO; it’s around the same size as VOYAGER, though. When it is spelled out like that, it is staggering! I read a lot, so the longer the book, the better. I want it to take me more than a day to get through, and your books always do that. I am eagerly anticipating MOBY! It’s really a nice symbol and cover, but what I am really looking forward is to meet Jamie again! Please, do not forget your Brazillian fans! Ruth Carolina, from São Paulo. Vey nicely done. I love the cover! Seems that a lot of symbols are hidden in it. Cannot wait for this book…is there a release date for this book? One more question though. Is it going to be an early Christmas gift? Wonderful! Can’t wait for December to break the seal. Thanks so much for good, interesting, thought-provoking reads. Impatiently waiting to read this! Boy oh Boy, it is only Spring!! I love the design; it’s thought provoking. Just a thought, more of an afterthought, about that little drop of blood below the octothorpe. If it were in the shape of an asterisk * (the symbol about the number 8 on the keyboard), that would be pretty cool. Just a thought. I love the design; it’s thought provoking. Just a thought, more of an afterthought, about that little drop of blood below the octothorpe. If it were in the shape of an asterisk * (the symbol above the number 8 on the keyboard), that would be pretty cool. Just a thought. Just keep writing. I’ve read all your books several times and can understand just how much work goes into each tome. While I’m waiting for MOBY to be published, I have picked up Dorothy Dunnett’s book Niccolo Rising to re-read and enjoy for about the fourth time. Fortunately there are 8 books in this series so this should keep me going until the end of the year. Be warned – her books are not an easy read, but the plotting and characters are wonderful, and each reading brings out more detail in the story. Sadly Dorothy Dunnett died a few years ago, so there will be no more gems from her. The suspense and anticipation are building …..
Dear Norma – You did not mention Dunnett’s other series, about Francis Crawford of Lymond & Sevigny, all the titles refer to chess in some way (Game of Kings, Queen’ s Play, etc. ) I began these in the late 60′s, early 70′s as I recall. Am now rereading for about the 15th time. Until Outlander this was my favorite book series, but Jamie and Claire have pretty much caught up. If you haven’t read it, and you do like the Niccolo series, do try this one! Thanks you for mentioning the Francis Lymond Series. I have read these as well – they’re my stop gap if I finish the 8 Niccolo books before MOBY publication date. There’s also King Hereafter, which is the historically accurate story of Macbeth. Nice to get some input from a fellow “good-read” fanatic. The cover of the new book is stunning! Fits right in with the rest of the series. Thank you for what you do Diana. Had a pretty rough week, my mum had breast cancer surgery. During her surgery I was re-reading Dragonfly in Amber for the umpteenth time to take my mind off things. It’s amazing how you can take our imagination away! Blessings to you Diana and all your fans! Currently planning a trip to Scotland to walk the same paths of my ancestors. The Outlander series has truly inspired my interest in discovering my roots. Thank you for awakening this desire in me (and in so many others), but mostly thank you, Dr Diana, for entertaining me for hours on end. Can’t wait for MOBY!